President Obama’s trip to Cuba inspired ire as much as goodwill, from Republicans hounding his decision to take in a baseball game while terror unfolded in Brussels to humiliating his teenage daughter after doing the wave at said baseball game. But you know who else wasn’t thrilled with President Obama’s three-day trip to Cuba? 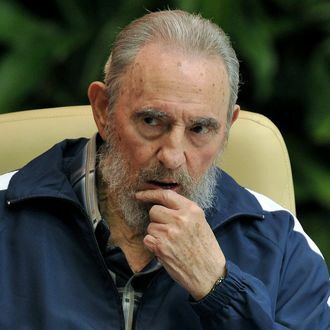 Ex–Cuban president and brother to current head-of-state Fidel Castro. Castro, the communist leader who ruled Cuba until passing power to his brother, Raúl, in 2008, penned a 1,500-word letter entitled “Brother Obama” in Granma, the communist party’s official newspaper. In the missive, Castro spurned Obama’s diplomatic advances and tore apart his big Havana speech. Though Castro complimented Obama’s “modest upbringing” and “natural intelligence,” he really would prefer that Obama and the U.S. stay out of Cuban affairs. “My modest suggestion is that he reflects and does not try to elaborate on theories about Cuban politics,” he said in one of his many disses. He added the Cubans would “risk having a heart attack” over Obama’s words about Cuba and the U.S. embargo. Obama didn’t meet with the 89-year-old Fidel Castro during his visit; Castro missed out on a chance for an awkward-handshake photo op that his younger brother got with President Obama.